Today was my day off and I had arranged to meet some friends at the coast. We had morning tea and a long chat in a park and it was after 1pm by the time I headed off. I had planned to use the trip and petrol consumption wisely by incorporating a visit to East Coast Fabrics. I am regularly disappointed by the range and quality of fabrics available at Spotlight and Lincraft so when I heard advertisements for East Coast Fabrics on the radio recently, I made a mental note to check them out. Since I am working through my stash of existing fabrics I am loathe to buy too much so I was fairly restrained. I bought these two pieces to make some more skirts. 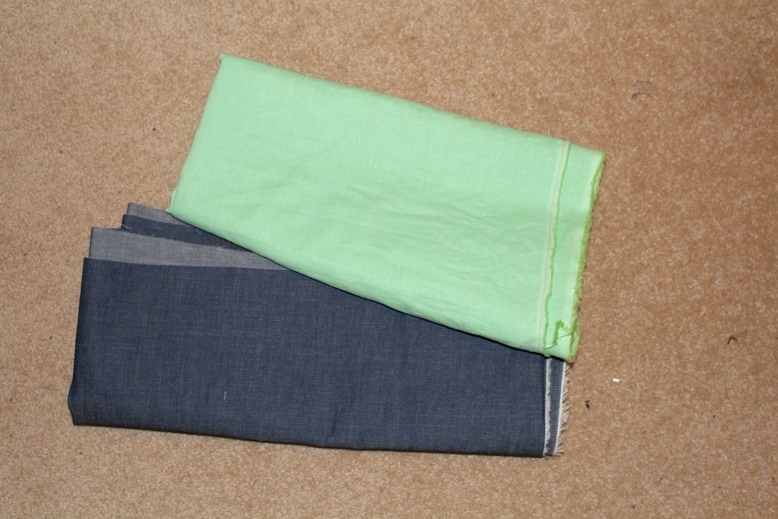 The mint green piece is linen and the other is a lightweight denim. The fabric plus a zip for each skirt cost $18.91 which I think is pretty good for two skirts. 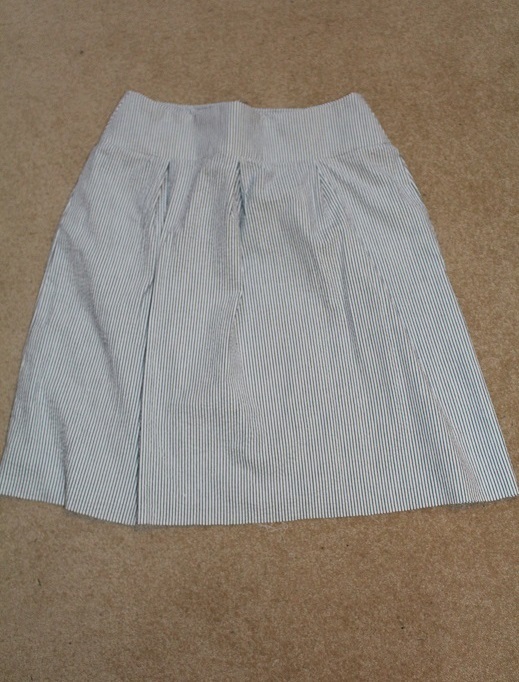 I will be using the same pattern that I used for this skirt I made recently. I am planning to take these skirts when we go to Singapore in September. I have worked out which tops I will wear with them. There is this one that I made a few weeks ago. I have chosen another three tops. 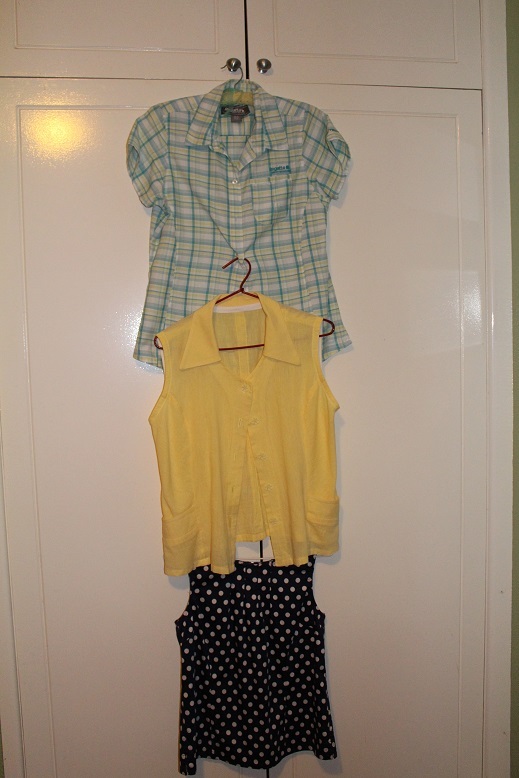 My thoughts are that all of the tops will go with the denim skirt, all except the yellow can be teamed with the green skirt and the striped skirt can be worn with either the yellow or white tops. I plan to add 2 pairs of sandals, a pashmina, bathers, sarong, hat, fabric shoulder bag and umbrella. A pair of pyjamas and some underwear and I will be set for pretty well anything that a week in Singapore can throw at me. It is now 5 weeks since we arrived home from our trip to the UK and Ireland. Those of you who followed my travel blog will know that I travelled fairly lightly and had 6 tops earmarked to go to the charity bin at the end of the trip. In this post you can see the 3 tops (red, blue and black) and the 3 striped 3/4 sleeve tops that I had decided would need to go. They were all pretty much past their use-by-date as they had faded, had small stains and the necklines were stretched and out of shape. I wore them to death for the 6 weeks that we were away and was glad to see the back of them at the end of the trip. 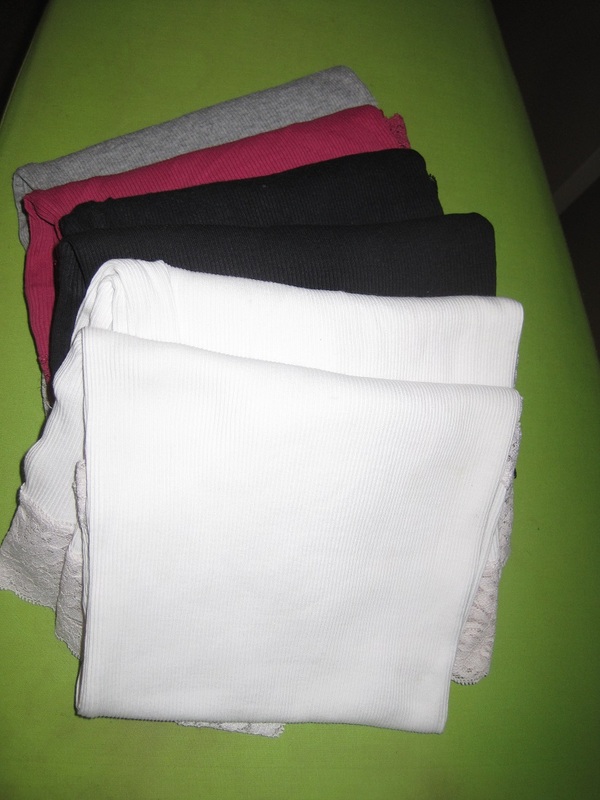 I think I have enough short-sleeved and sleeveless tops in my wardrobe but the 3/4 sleeve ones will need replacing. That will be a project before next autumn. In the meantime I did buy 3 pieces on the weekend we arrived home. I did not specifically set out to buy any of them. The Duke and I went to Maleny to pick up a few groceries and I decided to take a look in a small boutique. 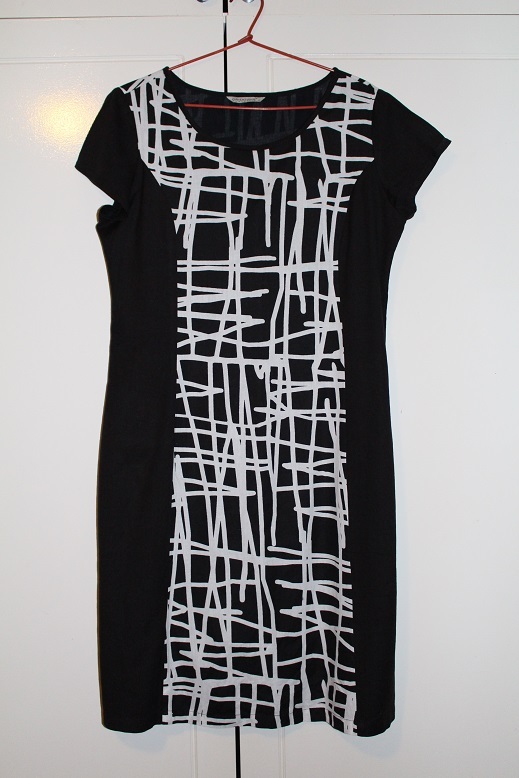 I found this dress which is 100% cotton, lined and cool and comfortable. The fact that it is black and white is an added bonus. Next, we wandered across the road to a recycle boutique where I struck it lucky. 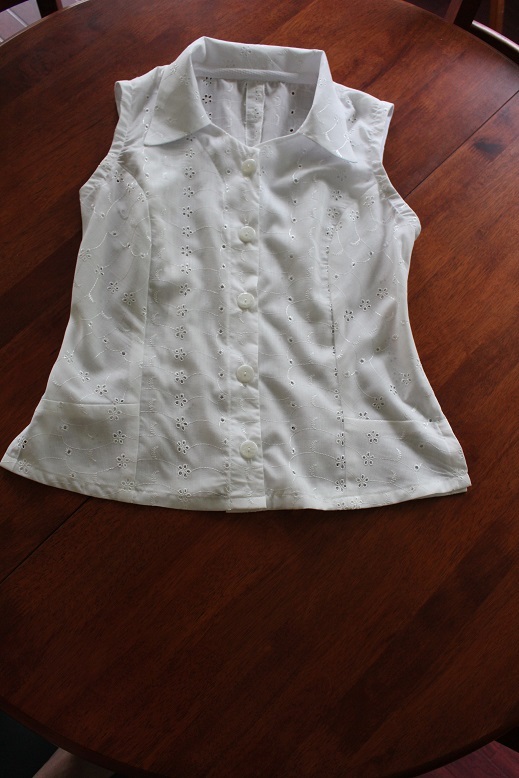 This blouse is also cotton (with a touch of spandex) and I don’t think it had ever been worn. I discovered why that was probably the case when I tried it on. The top button was at the level of the bottom edge of my bra! It was an easy matter to make another buttonhole and add a button. Also, black and white! 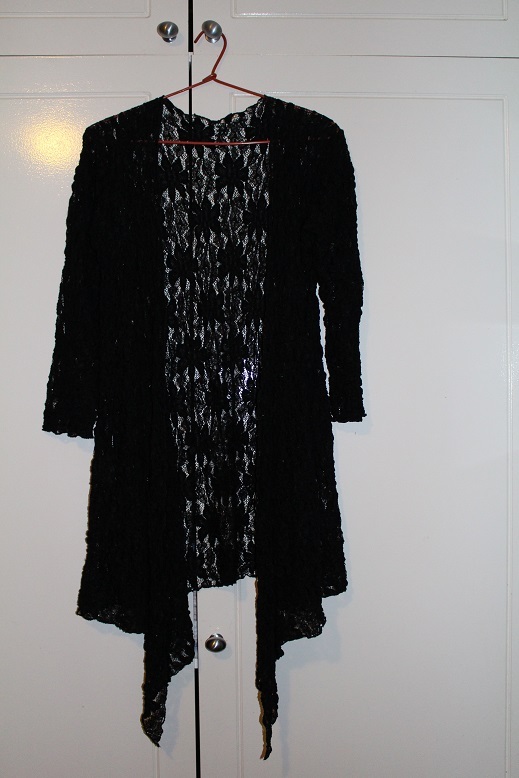 Finally, I found a lovely stretch lace waterfall cardigan by Mela Purdie. This was also in the recycle boutique and a steal at $35 when it would have been around $250 when brand new. I am really pleased to have found these pieces and feel that they are all worthwhile additions to my wardrobe. For those of you who may be new to reading this blog, it is probably timely to explain about Project 333. It is a concept developed by Courtney Carver in which you commit to wearing a maximum of 33 items for 3 months. You can read all about it at her blog, Be More With Less. I first discovered Project 333 in April 2012 and followed the guidelines carefully for the next 3 months. Since then, I have continued to streamline the contents of my wardrobe. I am constantly striving to create a small but effective selection of pieces which work for me. For ease of searching, I have used “Project 333” in the title of all of my clothes-related posts. If you have not read them all you can search all posts under this topic to gain a broad understanding of what I am doing. I have been in Sydney for the past 2 days for work. I needed to be appropriately dressed on Tuesday when I arrived as well as yesterday and today. I was meeting friends for dinner on Tuesday evening and attending a work-related dinner last night. The constraints were that I planned to only take carry-on luggage as well as staying in a hotel and no opportunity to wash clothes. 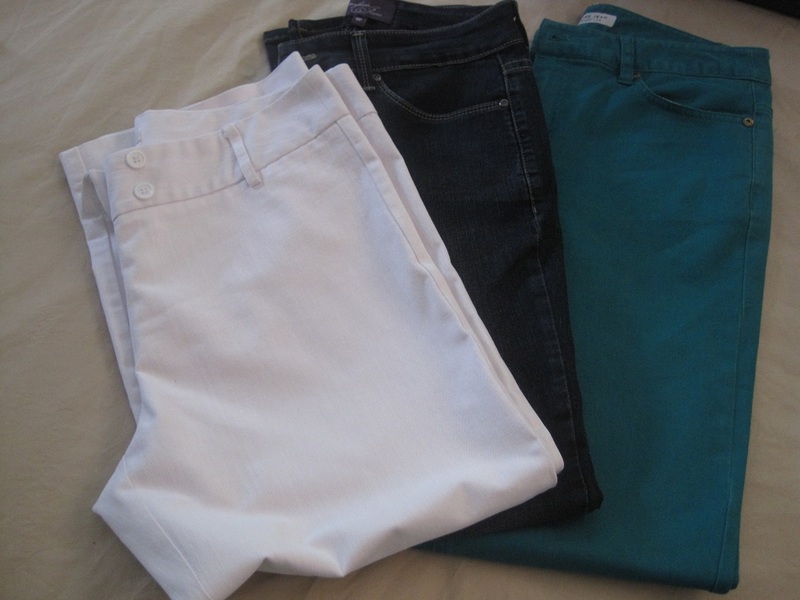 Green jeans, denim jeans and white 3/4 trousers. 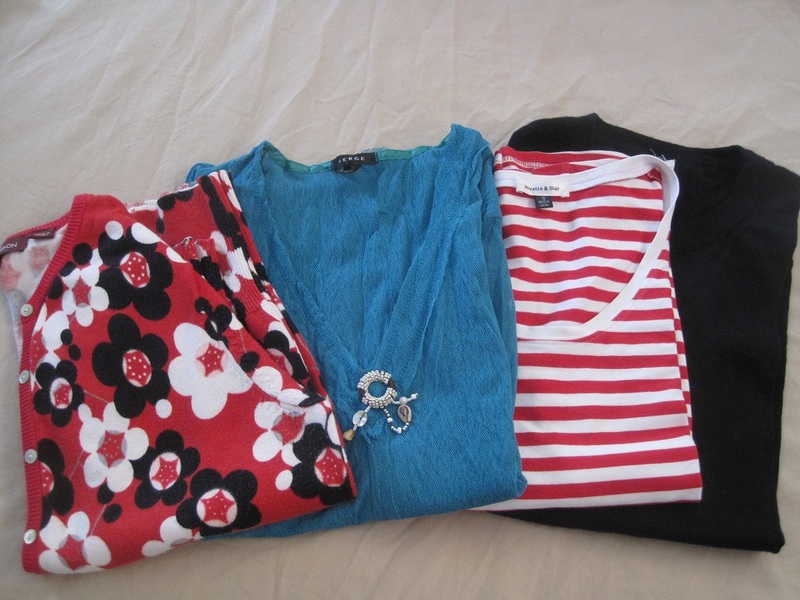 Floral cardigan, teal top, red/white striped tee and black pullover. These all have 3/4 sleeves. I find these very practical for a range of weather and they can be worn in a variety of ways. 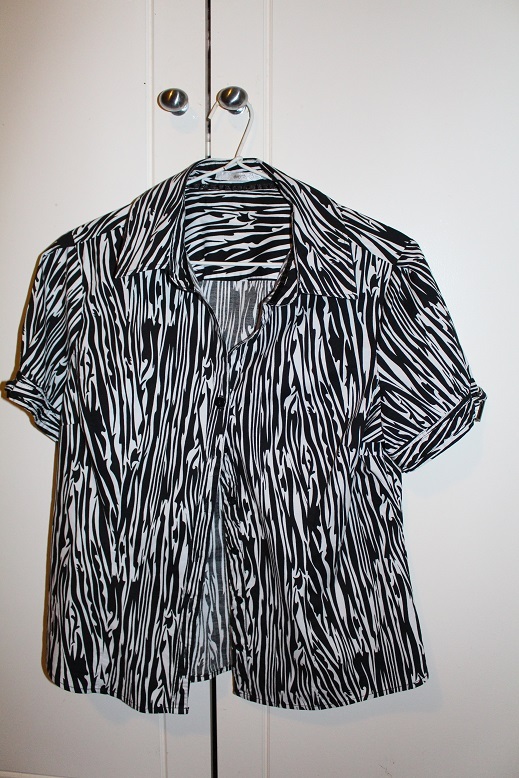 I also packed a black camisole, black/white checked short sleeved shirt and leopard print scarf. 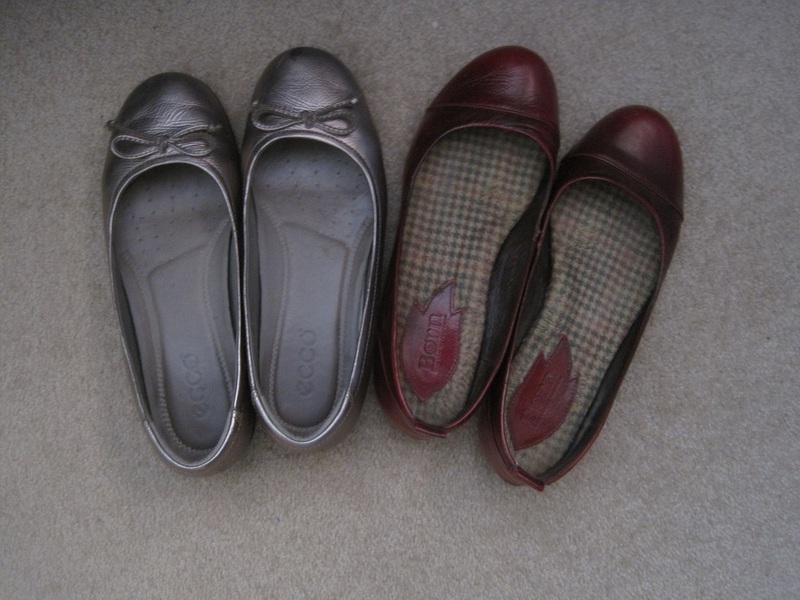 2 pairs of flat shoes completed the selection. I try not to wear the same shoes every day. Denim jeans, red/white tee and red flats on Tuesday flight. Green jeans, black pullover and scarf with pewter flats for dinner on Tuesday. Denim jeans, black camisole, teal top and pewter flats – dinner on Wednesday. White trousers, checked shirt with black pullover (if needed) and flats – work on Thursday and flight home. I really only wore each item once , however, the combinations are almost endless. The only ‘no go zones’ as far as I can see were the green jeans with the teal top, the red flats with the teal top or the the striped top and floral cardigan together! My maths is not good enough to be able to calculate all of the possible permutations but I know there were plenty of choices. All of this confirms what I have often said, “You need almost as many clothes for a couple of days as for a few weeks”. How do you decide what to pack? Have you ever travelled for an extended period of time with only one bag? On Friday afternoon The Duke and I picked up Miss O as she was coming to stay for the night and most of Saturday before meeting up with her Mum at a family BBQ late on Saturday afternoon. Whenever either of the grandchildren come to stay something invariably gets forgotten and it is often a toothbrush so we reminded Miss O when we arrived. This time it was spare underwear that was left behind and then when it was bedtime she announced, “Mum forgot to pack any toys”. I pointed out to her that it was not actually her mother’s responsibility to pack toys – after all Miss O is nearly 6. 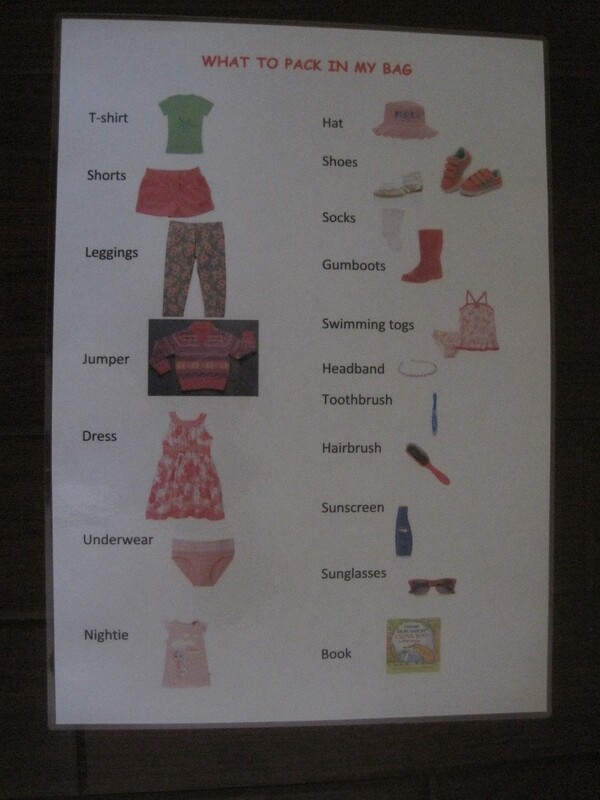 I decided to help Miss O to try to overcome things being forgotten so we made a packing list. This is what we created. Miss O decided what needed to be on the list and with the aid of Google we found images to go with each item. Naturally, there will be seasonal variations and not everything will be required each time she packs to go somewhere but I am hoping it will be a useful prompt. We did not get it quite finished on Saturday but it is all done now, laminated and posted to Miss O as promised. The picture prompts will also encourage her reading skills. This week the weather has turned warm, even hot by some standards and it is officially still winter. Many of my clothes are suitable for most of the year depending on how I wear them. However, the warmer weather has made me stop and think about what new things I might consider buying this season. I have 3 good pairs of shorts and probably enough skirts but it might be time to get some new tops. Other than that the 2 main things on my wishlist for summer are sandals and a hat. My current sandals are well-worn and have been repaired. They will keep going for some time yet but it would be nice to have a new pair to wear to work during the summer months. The hat that I crave is a straw one in a dressy style. Since I am not tall, I find that I need a hat with a straight or slightly upturned brim or otherwise I end up looking like a mushroom. I have a fabric hat which is fine for travelling and beachwear but I would really like one that I can wear with a dress in the city. That is enough about my wishlist, now for the workhorses. These are some singlet tops that I bought at Uniqlo when we were visiting Japan in 2009. They are some of the most versatile items I have ever owned. I wear them as singlets in winter, pyjama tops with boxer shorts, tank tops in summer and even to work as a camisole with a skirt and cardigan. The lace edging and straps are actually elastic lace and they are really comfortable. When these wear out I will definitely buy more or possibly make some if I can find suitable elastic lace. Having items of clothing that do double or even triple duty will be very useful when I come to pack when we travel overseas. I am hoping to travel as lightly as possible. Do you have any particular ideas that have worked for you? This week I have finalised a few more details regarding our trip. Sent order for a SIM card to use in our mobile phone while we are away. Traced Miss O and Izz’s feet so that I know what size shoes to buy for them. Checked on the insurance coverage for our car if someone else is driving it. Arranged with the housesitter to transport us to and from the local train station en route to the airport. Shortened the hems on our new travel pants. Started putting some miscellaneous items in the spare room ready to pack (tripod, compass, travel clothesline, microfibre towels). I have also finished reading the travel guide on my Kindle and am feeling confident about where we are going and what we plan to do. The countdown is well and truly on now.